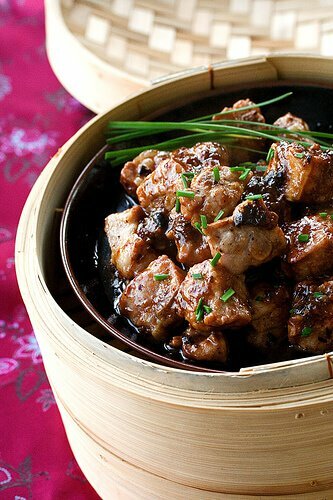 A dim sum favorite dish is steamed spareribs in a black bean sauce, pronounced, “pai kuat” in Cantonese. My family is from Hong Kong. I remember my Gong Gong (grandfather) taking me to dim sum every weekend. 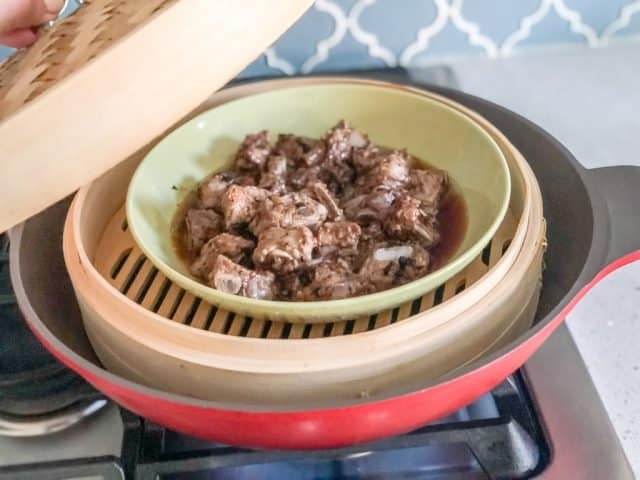 The dim sum cart pushers would rattle off the specialties in her cart, and we’d order at least 2 dishes of black bean spareribs. If you are lucky enough to live near a large Asian supermarket that has a meat section, the pork riblets are easy to find. Cut the ribs in between the bones to get bite sized pieces, easy for steaming and eating. No Asian market? 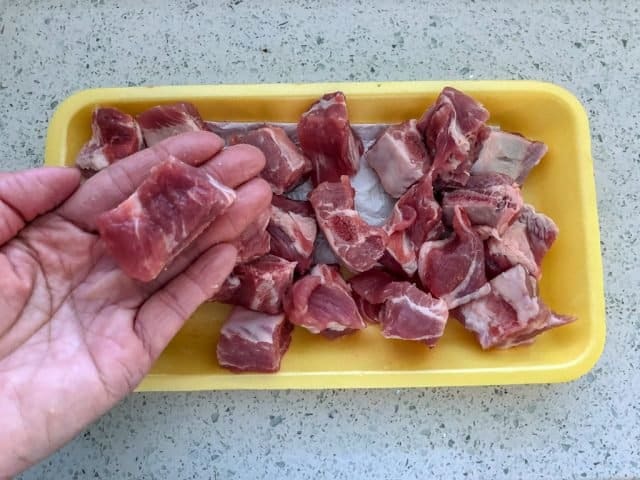 Bribe your butcher to cut normal spareribs cross-wise to get small 1-1/2″ riblets. Traditionally, whole black beans are used in this dish. However, they are hard to find outside of Chinese markets. I’ve substituted with jarred black bean sauce – which you can normally find in any supermarket ethnic section. This recipe only took about 5 minutes to prepare and 20-30 minutes to steam. There are many different types of bean sauce, so make sure you get the right one. It should say BLACK bean sauce. Toss the riblets with the Black Bean Sauce and the rest of the sauce ingredients. 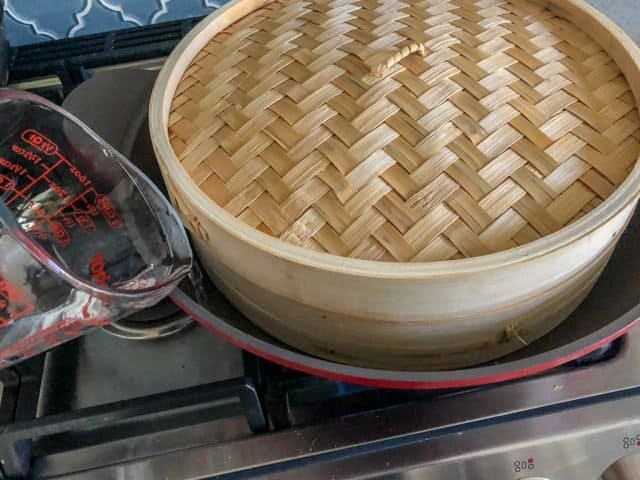 There are different sizes of bamboo steamers. Some very small, for single serving (like you see at Dim Sum restaurants), and others larger that are meant for family-size. 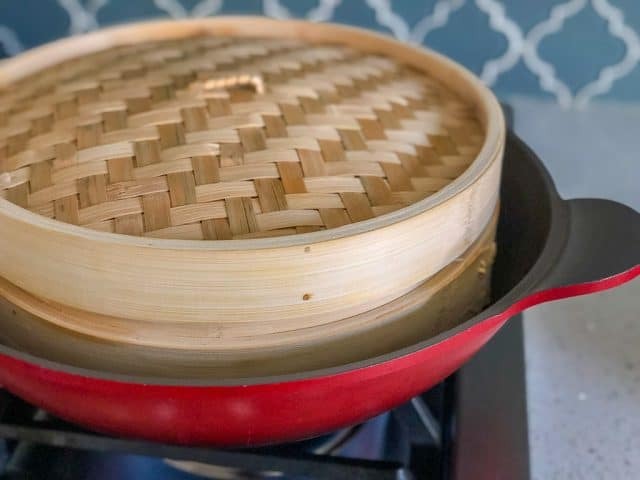 Fill up a large pot or wok with water and place a steamer stand (or upside down shallow bowl) into the water to prop up the steamer basket. The bamboo steamer should NOT sit in the water. It’s important to make sure you don’t run out of steaming water! If you don’t see steam rising, add more water. Cut between each sparerib to separate each rib tip. In a large bowl, combine the rest of the ingredients. Add in the ribs and toss well to coat the spareribs evenly. Wow! 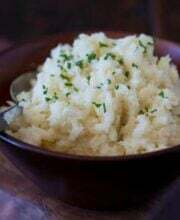 This is my favorite recipe i make this for my family once a month served on rice delicious. Asian grocery store near me is were I get my spare rib tips. Very similar to what you get at Yum Cha in Hong Kong. Simple and very authentic Cantonese dim sum. I just moved to South Texas (Corpus Christi area) from Toronto (where all the delicious cultural food is). I miss dim sum. I think I’m going to make this this weekend. I hope I can find rib tips. If I can’t find rib tips do you think using regular spare ribs will be taste almost the same? Why rib tips? Hi Jenny – the rib tips are the most tender parts, and the “bone” in the middle is mostly cartilage. 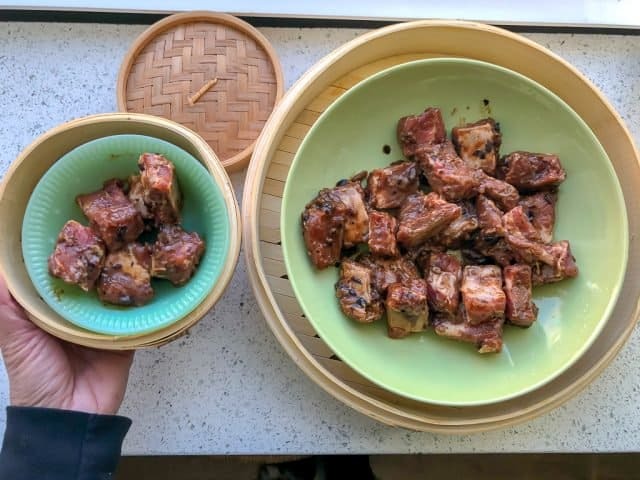 Yes, you can use regular spare ribs, but the texture will be different – chewier! But certainly still delicious! Try looking for an Asian market – if they don’t have a fresh meat section, ask if they have frozen rib tips. Also, talk with your butcher at your regular grocery store – he or she can probably special order! 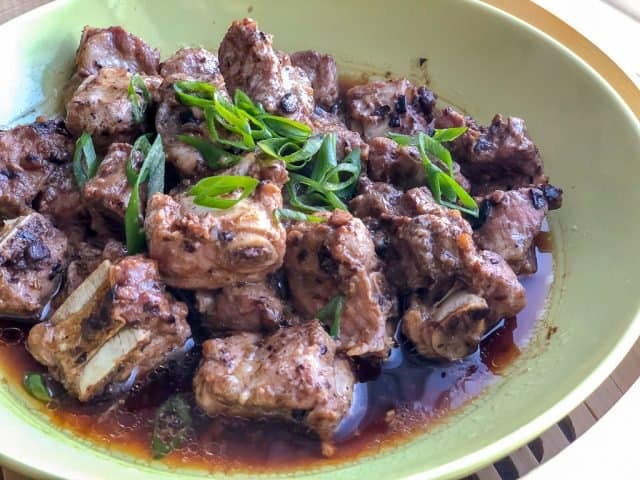 I ended up using riblets and though the texture wasn’t the same, the recipe itself and the flavors were delicious! 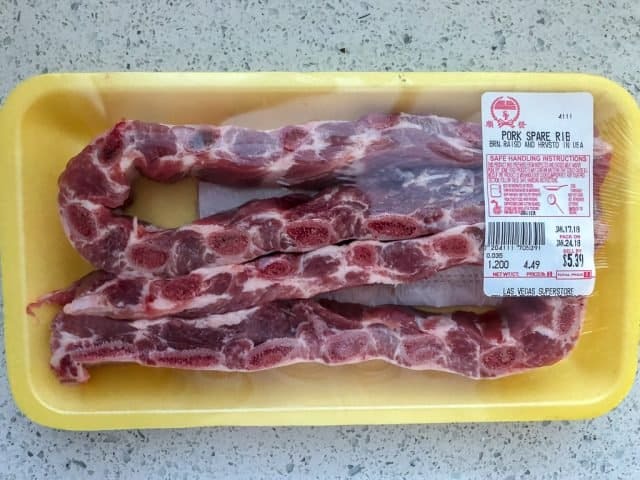 I will try finding frozen rib tips at some of the Asian grocery stores around here next time. Thanks for the recipe! Hi, I thought maybe you would like to know that I have found the riblets at my local Walmart. I do not know where you reside, but if I am not mistaken, there are Walmart’s in all four corners of the world, if there isn’t, trust and believe there will be soon. Fantastic recipe. I made it yesterday dinner and it was om…..delicious. Lovely recipe! I absolutely LOVE pai gwat. I wonder if it there is an easy way to make this on steamed rice so that the flavors can soak in..
Oh, how I laughed when Imread your PS about Bob! Then I busted a gut when I read Miss Twist’s reply. Not to fear! My husband duct taped my guts back in and no longer puts me on the counter to mix dough! I love Chinese food so much. I often go to the China Buffet to eat them. Thanks for sharing again. HI!!! This has become a weekly staple for which our 3-year-old son asks on a more-than-weekly basis! Thank you!!!! Just made this recipe. It turned out wonderful. Thanks so much! I’ve seen a similar ones that works with slow cooker. It’s called Chinese slow cooker ribs with soy been sauce. Hi! I really like your recipes, but I can’t find the “Print” button. I wish you can make your website to be able to print the recipe in simple format, for compilation. Thanks. I use this recipe all the time. Thanks!! Just wondering, did you purposely leave out SALT? Hi I hope youre still reading comments!!.. but I wanted to know if I can somehow cook this in the slow cooker. btw the pic looooks amazing! Hi Janeth – I haven’t made this in a slow cooker before! If I can’t find black bean sauce but I have Chinese fermented black beans, can I substitute that? If so, what’s the amount you would recommend? 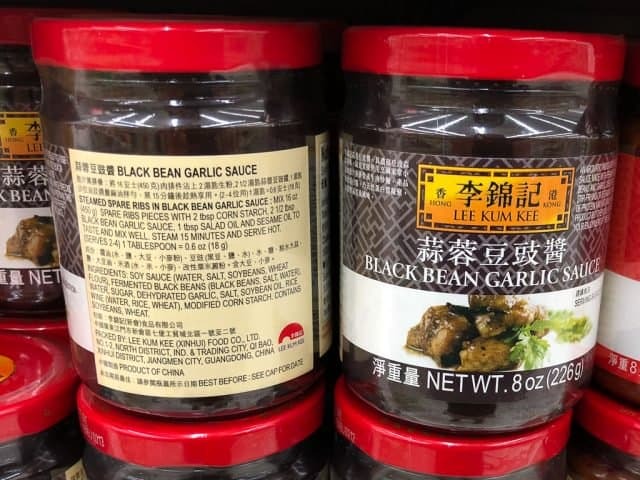 Otherwise, I can find Lee Kum Kee black bean & garlic sauce. Would that work too? 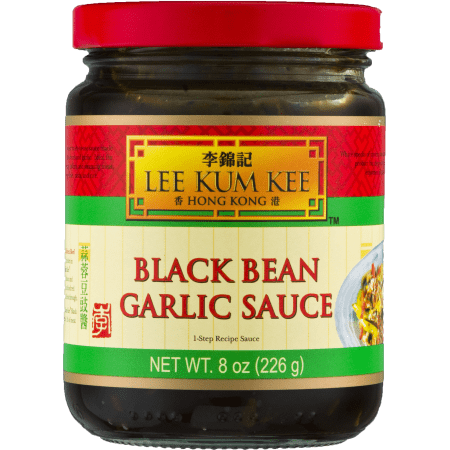 Find the Lee Kum Kee black bean sauce. Use that first and then experiment with the fermented black beans. This looks amazing! I just posted a reference to your cite on my blog! Thanks for sharing, and can’t wait to try this out! Would steamer the spareribs for 20 minutes or so be enough to make it tender? Yes, as long as you are using rib TIPS. Hi Joan! I just fixed the print function of the recipe. You should be able to print now! Just made this recipe, but with chicken wings! Wonderful, wonderful succulent sauce! Really incredible nuances of flavor here. I’ll be reheating it tomorrow for the CNY dinner, and I’m guessing that the flavors will be even better! Thanks Jaden, for your inspiration! Thanks! 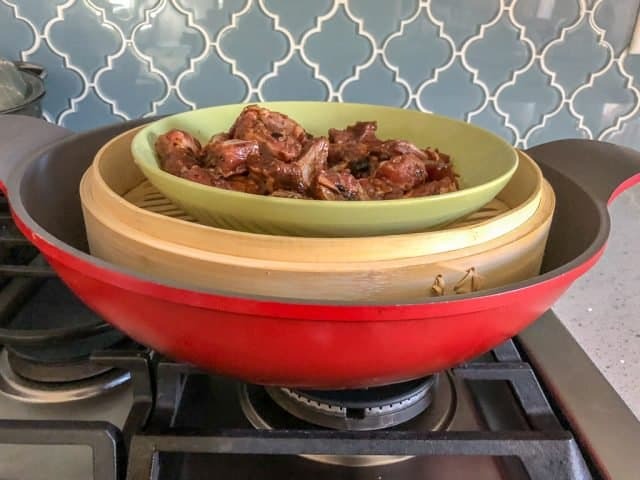 I use the same set-up when making a Moroccan steamed lamb dish, so I understand what you mean. All your juices will fall down the holes of the metal fan steamer. Just get a pot big enough to hold a shallow bowl. Then find something to prop the bowl up. I use 3 shot glasses! I know that this post is a couple years old, but hopefully you still read the comments! I don’t (to my great shame) have a wok or a nice Asian steamer. Would doing this in a pot with a metal fan-style steamer do the trick? How would it affect the recipe? I am a 16 year old chinese girl living in north carolina. I just wanted to tell you that my best friend is going to hong kong and I’ll never see her again, so i’m sending her off asian style by hosting a party with your amazing recipes! Thank you! Please give the the titlte of your cook book so I can buy. Thank you very much. I have been to Hk too. As I know, the steam spareribs is not really a dim sum dish. They served it as a dim sum dish sometimes . 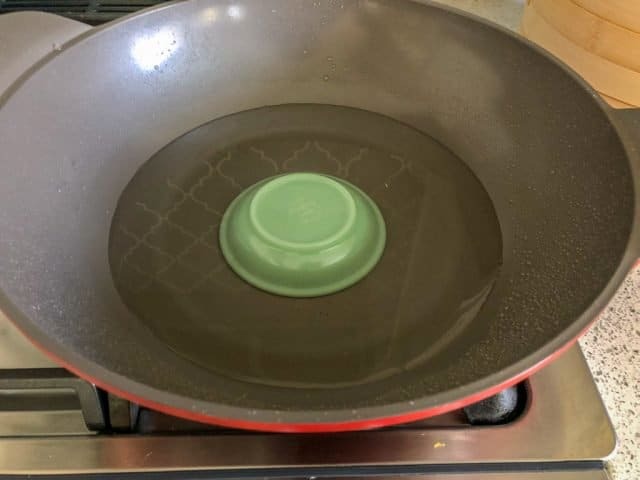 It serves with rice in a pot. A famous dish for pot rice in winter time.you need not to have streamer.. you may cook it with rice in a electrical cook. First, cook the rice until it start to steam then put the miranated spareribs on top of the rice.. wait for 10 mins… you will have sparerib with pot rice. Junith: The black beans are very different. 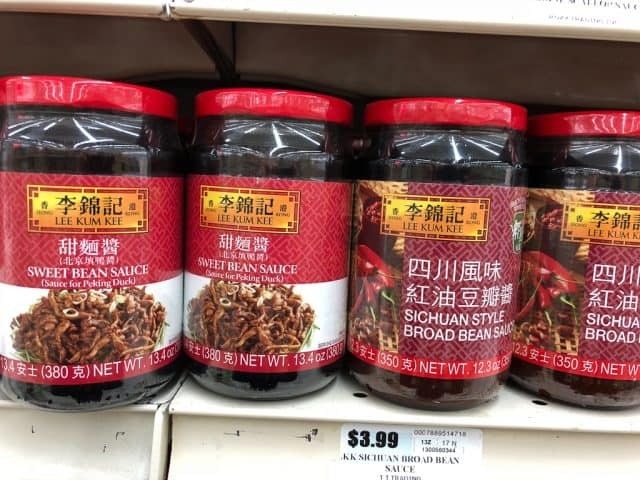 Look in the Asian section of the market, for the jar of “Black Bean Sauce”. P.S. Got the spice and can’t wait to use it. Everyone is sick, so the only stinkin’ thing cookin’ is canned chicken noodle soup that they want! Nothing else will tempt them right now. Thank you so much! I have been looking for this recipe for a while..by the way..sorry about Bob. Believe me with these recipes we’d buy the cookbook even if you were giving out a few free flyers. All the best to you! I was at the butcher’s today and they had beef short rubs, which I had them cut into smaller pieces to try this with. I know, should’ve been pork, but I didn’t have the recipe with me. Think they’ll work? This is one of my Mom’s favorites when she goes to dim sum. Sometimes she has me go track down the cart before it gets to our table. It’s the last thing I want to do when I visit her up in Toronto. I really appreciate that speed of this dish. It’s all in the prep and you just set things off to steam. What About Bob?! Actually, I’ve heard that after brain surgery it’s very good to get right into rehabilitation and get back to work as soon as possible. So you did the right thing. Oh, and I’m sure most of your loyal readers would love to have the cookbook. I also agree that people would buy your cook book even though the recipe’s are online. For reference see wilwheaton.net he’s published several books of his blog and done well for himself. I’m glad I’m not the only one who names appliances. My Kitchenaid in called Rosie, because she is red. I won’t mention what my oven’s name is. It is unprintable because he is very tempermental! Steamy Kitchen, that looks sooo good! You don’t have to worry about finding dim sum since you can just make it yourself! Bai gwat was my favorite growing up, but I always find it hard to eat and really get all the tender meat. I’m a lazy eater. 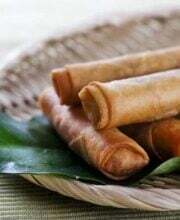 Hey, all the great pai gwat I have were so tasty sweet. Not sugar sweet, just this nice sweetness. Do you think that was just the bones giving off a slow cooked sweetness or is there something in the sauce or marinade that makes it that nice sweetness? Thank you for stopping by my blog this week! 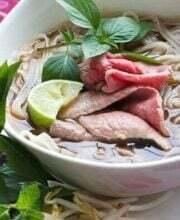 All of your recipes look SO delicious..wow!! My mixer suffered the same fate as Bob, but seemed to be especially despondent as it performed a murder-suicide, taking the rice-cooker full of oatmeal with it. Husband performed the same brain surgery on my Kitchen Aid. He then marched right out and bought me the Kitchen Aid Pro series mixer to avoid exposing the patient to repeat procedures. Oooh! I would have loved to attend a class given by you and Bee! Sigh…until then I will have to console myself with those steamed black bean ribs 🙂 MMM! Am now heading to local butcher to beg for crosswise cut spareribs. Bossy just collapsed into a Hunger Coma. That IS so cool! And those ribs looks fabulous! Definitely worth getting your nails all sticky and red. Think value added for your cookbook. How about CD or DVD that would have you demo the recipe along with your witty patter. Mmm. I’d buy it. My mom has a whole closet full of cookbooks that she uses all the time and never reads blogs– I have a few cookbooks that I rarely use (except when I need in-bed reading material), and am more likely to buy one when I’ve liked the writing style on the blog first. And I’m sure your beautiful face would sell some copies too. …Unfortunately, you’ve made me hungry for Dim Sum, and there’s *noplace* to get it- or anything but the most basic ingredients in DC… So I may need to learn the patience to futz with small things. P.S. I would “hella” buy your cookbook. Jaden, this makes me really sad. I mean, your spareribs are lovely and all, but it won’t make up for the fact that I’m totally going to miss out on your cooking classes by ONE DAY. 🙁 boohoohoo. I won’t be in LA until Sunday afternoon because I have my last final at Berkeley on Saturday. Yes. A final exam on a Saturday. I am mucho sad that I will be missing out on learning to cook w/ Steamy Kitchen AND Rasa Malaysia. UGH. Excuse me while I weep in my corner of weeposity. Adren – yes you can! The large Asian markets that I normally go to in California have incredibly fresh meat – they sell so much so fast that the turnover is very quick. Now, that being said, I wouldn’t buy meat from the little tiny Asian market near my home in Florida. It’s a super small market with little turnover. I just don’t trust the quality and conditions. I guess my answer to you if you live near an Asian market that is busy and has a professional meat counter (not just a cooler) – it is probably good meat. You are mistaken in assuming that people will not buy a cookbook if the recipes are online for free. This is he same flawed thinking that has the recording industry in it’s death throes. The fact is, yes, people will consume things for free if they are available, but that will not stop them from buying things as well. In the music business, all the studies not funded by the RIAA show that people who download free music tend to go out and buy more CDs than people who don’t. Also, if someone likes downloaded a song, the likelihood is that they will go out and buy the CD because the CD has a booklet, a nice case, the disc has a design printed on it etc. In other words, the physical object is as pleasurable to the user as the abstract content. So, if you provide an enjoyable experience on your site, and you also offer a cookbook to purchase, they will buy. You’ve already established yourself as a brand, displayed the quality and freshness of your product, you’d be a fool NOT to put out some cookbooks. People love and collect cookbooks. You can display them artfully on a coffee table or a book shelf, you can fall asleep at night reading them in bed, both things you cant do with a website. Yay, you’re making me crave for these rice toppings from my favorite resto in Chinatown Manila! 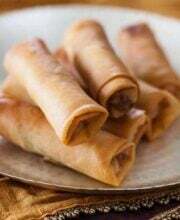 you mentioned all my favorite dishes to eat for yum cha! reading your post made me want to eat those now! jaden, when i see these packaged meat at my asian store, how do i know that it is good beef and pork and is sanitary considering it comes from the orient and is usually in the frozen stage? If the meat is fresh, then how do i know it comes from sanitary conditions…these small groceries ..are they regulated? Can you use the same sauce and stir fry it with sliced beef?? Reminds me of Black Bean sauce Beef Hor Fun (rice noodles, nope, not Whore Fun)!!! First of all, I’d like to go on record and say that I would buy your cookbook even if I had access to every single recipe online for free. There. If nothing else, you have one dedicated and eager buyer. Secondly, I thought I was the only one who named her big mixer, which, btw, looks identical in color and model to yours (white, Professional series) – my mixer’s name is “Animal” because the first time I used him – it’s a he, btw, like your Bob – he made those growly noises like the Muppet… and so… Sorry that Bob needed brain surgery. Animal is like my most prized earthly possession (perhaps because it was my first major real kitchen purchase when i had like no $) and I’d be super sad if he got hurt. But I think both Bob and Animal like being put to use – that’s what their job is supposed to be. Sitting idly in the corner, especially with tape and stuff, would make them sad – good thing you used it right away! I do love black bean; only this weekend past I organised yum cha with friends, and introduced some of them to the delight of chicken feet with blackbean. Not all tried them, and not all of those that did liked them, but I was proud of them for trying! I’d buy your cookbook , Jaden! 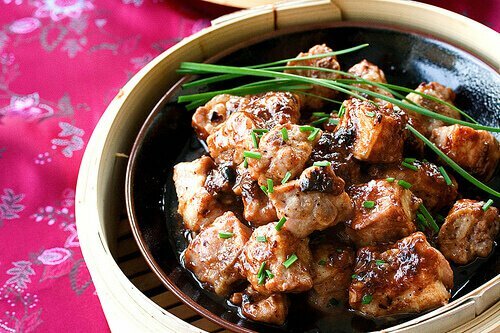 But thanks for publishing the steamed pork ribs recipe because this is my favorite dimsum dish. How exciting – you and Bee…I wish I could be there to attend the class. Have fun! Mmm I loves me some dim sum. I also always order fung jow but not so much with the pai gwut. However, a long long long time ago I went to Hong Kong with my sister to visit my aunt and cousin and they took us to this amazingly great dim sum restaurant that served pai gwut fan. I’ve been to a bunch of dim sum restaurants locally and can’t find this!! I’m not sure what kind of magic they put in the rice, but it seemed a little more complicated than putting pai gwut and juices over rice. It seemed like it was baked in a clay pot or something. Do you know how they do it? OMG! My favorite dim sum selection! Thank you for posting this. And, believe it or not, (although I think you’re being facetious) many bloggers go on to author books that are for the most part reprints of blog posts. I know I would buy it. btw, just noticed your comment on the mango heaven sauce and shrimp! glad you liked it! Except for the chicken feet, those are the same dimsum dishes I pick here in Manila PLUS two more — chive dumplings and stuffed eggplant (deep-fried and/or steamed). Roast duck (over rice or in a noodle soup) for entree and mango with peral balls for dessert. Ooh la la, watta life! Thanks for sharing the recipe–gotta try it soon. I’ll buy your cookbook — there’s something about cookbooks that recipes-on-the-net can’t satisfy. Poor Bob. But better his head got broke–than one of your cute little boys breaking a limb because of chandelier. i always like spare ribs with black bean sauce 🙂 tastes good too with spicy black beans. and i really think that the cooking class with Rasa Malaysia is going to be great! can’t wait to read about the event. that is one pretty photograph. the ribs i meant! and yeah, bob looks tired! Hey Jaden, sorry for not dropping by lately with personal things. Great to have read of you new aisan cooking class coming soon. Hmmm it is now tickling me of doing one under sifu Steven Cheng…lol! I am away from KL more than a week now and mis so many things such as huge red lobster dish and huge red fish dish create by sifu steven cheng for his clients, end up no pictures take and no post! 🙁 Many more next time when I get back. So take cake babe and have fun with your cooking together with rasa malaysia. I would so buy your book. As I will be buying some ribs to try this recipe. Glad Bob is on the mend! 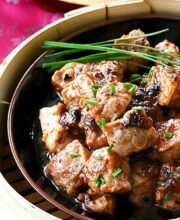 Give me more rice for this black bean sauce steamed spareribs! Steamed spareribs? Yum with extra yum on the side! I’d buy your book so I didn’t have to look recipes up on the computer. The “convenience” of the internet isn’t always so convenient. But, I’d want an autograph on that sucker! Yummy ribs! Good to know u can make it from scratch cos I always thought it had to be the black bean sauce in a jar by LKK(Lee Kum Kee) of HK. Re: Bob…u should write to KitchenAid abt it and say how very impressed u are with their product etc etc, they may reward u with a new machine!! Great looking spareribs! I like the sound of black bean flavoured spareribs. You rock!! this is my absolute FAVORITE dim sum dish!!! Thanks for this!! I’d buy the book anyway! Though, I’ve been playing with the same idea (I have a title in mind, which really gets me fantasizing), and have considered the same problem. Oh, Jaden, I forgot to say that i’d buy your bound copy blog book. But you have to autograph it! mmm ribs anything is yummy! So when are you coming to London to teach us how to cook. Lord knows we can use it! Poor poor Bob! But isn’t he a trooper to get up again and knead that dough like nothing happened. I love my Kitchen Aid mixer. it would be a tragic kitchen accident for my baby. When in London I love Cha Siu Bow from the Chinese bakery in Soho-China town. Such a treat! this is our ‘must order’ dish each time we head for dim sum. and what a retro looking bob… glad he survived the brain surgery. I agree Jaden. People buy cookbooks to have the tangible bound books, lovely photos and all, in their kitchen. I promise Joyce and I will buy it, even if we’ve read the blog and had you lead us by the hand in coking them. I read where at least one person has published his entire blog as a book. So, maybe its not as dumb as it sounds to put your recipes on your blog, then come out with them later in a cookbook. They would probably reach an almost entirely separate audience. Oh man I would so love to be in that class! Unfortunately my trip to LA-LA land will be too late to make that date. Those Chinese spareribs with black beans look absolutely DELICIOUS but i must say…the pictures of Bob with his head cracked opened are a bit disturbing…is he doing okay? Where can we send cards and/or flowers to wish him well? You AND Rasa are teaching the class?! Very cool. The 14th is a no go, but perhaps the 15th. Hmmm.